I did not start liking brussel sprouts until I was older but now I can’t get enough. 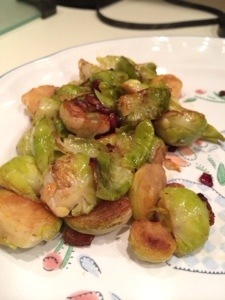 I love cooking them up different ways to get brussel sprout haters to fall in love with them. This time I had some bacon around and I figured everything is better with bacon. Start by cutting up bacon into small pieces and toss onto a hot pan. Slowly brown the bacon to render fat. While bacon cooks slice brussels in half. Once ready toss brussels into pot with salt and pepper. Mix and cook covered over medium heat mixing every few minutes. After a few minutes add water or wine and continue to cook until Brussels are fork tender. Then remove cover add vinegar and cook till liquid is gone. Serve hot as a side to any protein.